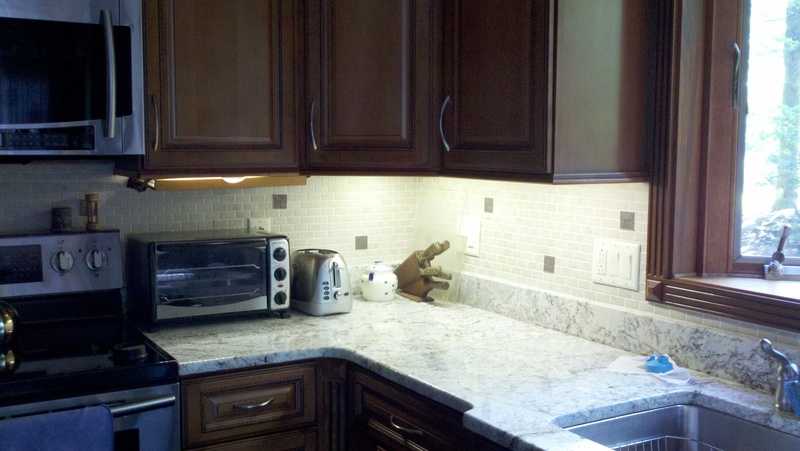 I recently renovated a kitchen which included installing new cabinets. The owner wanted to have task lighting mounted directly under the cabinets over the main food prep area. She did not want the halogen puck lights because they are hot and the bulbs burn out too quickly. I suggested LED lighting and, with her agreement, set out to find some acceptable solutions. To make a long story short, the LED lighting on the market for under cabinet installation is pricey and there is limited selection of styles. So I set out to design a solution and came up with this great alternative using readily available LED Strip Lights. I had to buy some 3/8″ aluminum C channel and a roll of LED Strip Lights plus power supplies. I found the first strip light solution on the Home Depot website, but at 128 Lumens per foot, the 4 foot space would get me approximately 500 Lumens of light – less than a 60W incandescent bulb. I figured that I could double it up, but it might not look as elegant. It was $70 on the internet store, plus I had to buy the power supply at $40. I set out to go to the local HD store and found little or no stock, and where I did find it, the actual store pricing was dramatically different. The solution was going to cost about $150 in parts if I bought it in the store. Also, the specs were not what I wanted. I went on the internet to find other suppliers and came upon one that sold many varieties of strip lights. I wanted a “Warm White” color and high brightness and found this one rated at 300 Lumens per foot. Since I knew I would need only about 4 feet, I decided to buy two power supplies so that I had a spare power supply for a different project using the remaining length of LED Strip Light. Total cost: $70! Step 1: Calculate the Electrical and Lighting Requirements. This particular strip light was rated at 4.4 Watts per foot. Since I was using less than 4 feet of the strip light, I expected to need 17 Watts for the total project. The 24 Watt power supply has plenty of reserve power and it wasn’t going to operate at max power when the lights were on. I always build in a margin of at least 25% when powering electrical loads. This power supply is nearly 30% more power than needed – perfect! The next step was to ensure that the LED’s would not get hot. I decided to use aluminum C channel to mount on the cabinet and stick the strip light to that. In this way, I could remove the light assembly from the cabinet if necessary, plus the aluminum makes a great heat sink to dissipate any residual heat from the LEDs. I drilled some additional holes into the sides of the C channel to add more surface area and allow air movement which increases the dissipation of emitted heat. Next, I calculated the lengths and lighting requirements for each cabinet. I needed 16″, 20″ and 10″ strips. The LED strip can be cut in 2″ intervals anywhere along the length of the 16 foot strip that I purchased making this easy. Just cut it with scissors on the lines as marked on the strip. The total length was 46″ or 3.8 feet. At 300 lumens per foot, this meant 1150 Lumens of task lighting which is a little less than a 75W bulb. Nice and bright! I cut the three strips and soldered lengths of 14 gauge stranded copper wire (at these lengths and power levels, 18 gauge would work fine too.) On each strip, I soldered the red wire to the “+12V” terminal (anode) and the black wire across the R, G, and B terminals (cathodes). Note that the “RGB” designation means they use the exact same strip for color LEDs too and the white LEDs will need to have all their cathodes connected. Once they were mounted under the cabinet, I twisted all the red wires together and connected them to the +12V wire from the plug-in power supply, and the all the black wires to the “-” or negative side of the power supply. One last [green] thing. I did not want the power supply energized all the time using an in-line switch in the 12V wires to switch on the strip lights. This wastes electricity because the power supply is always on. So I installed a light switch in the back splash and connected it to an electrical receptacle that fit behind the corner cabinet out of view. [You may need an electrician to do this part.] In this way, the light switch would turn on power to the power supply only when needed. This design saves electricity because no electricity is flowing through the power supply when the light switch is off. Scissors, screwdriver or drill/driver, utility knife, soldering iron, solder, wire strippers, measuring tape, hacksaw for the C channel. LED Strip Lights, power supply (big enough to power your strip length – about 4.4W per foot), 3/8″ aluminum C channel, wire, wire nuts (or electrical tape), mounting screws. I hope you find this article on how to make your own under cabinet LED lighting useful. Let me know of questions in the comments section below. Enjoy! Electrical Light Switch Installation Could Have Been Deadly – Part 1! Exactly what I have been looking for. Great video ! I assume the c-channel is because the adhesive would not stick to the cabinets? And you did not want to use staples? Also, I notice you mounted near the front of the cabinet. I have debated front vs back – what was your thought process for selecting the front? Thanks again for the very detailed video ! The C channel serves two purposes: 1) it acts as a heat sink to dissipate the heat generated by the LEDs. That will increase their useable life and maintain the emitted color range longer by keeping them cooler. 2) I wanted to be able to remove each strip and not worry that the double sided tape will harm the cabinet or the LED strip. I mounted the C channel near the middle of each cabinet, slightly forward of the center except for the left most one where there is now a pullout book rest. The camera angle makes it look like it’s closer to the front. Ideally, you want to place them so that the shadow of the front overhang of the cabinet (the light rail moulding) will fall just beyond the front edge of the counter top thereby leaving no shadow lines on the counter. The LED strip will easily stick to most any surface. Do NOT use staples. Using staples is not a good idea because the strip is really a flexible printed circuit. If you put a staple through it, you may short circuit the strip or cause it to fail with an open/broken circuit. Mounting the strip in that location was planned. It is slightly more toward the front of the cabinets than the rear. You may not be able to see that there is a strip of light moulding around the base of each cabinet. I chose the location of the strip based on the light shadow created when the LEDs are on. I wanted to ensure the shadow from the light moulding would fall just just past the edge of the counter top. This way, there are no harsh shadows on the counter top. The left most cabinet has an under cabinet bookshelf which left me little choice but to place the LED strip more towards the front of the cabinet. Nice post! If you don’t mind, I’d like to share these with my customers for an additional tip for their household lighting! Be my guest – send them the link to the video too! By the way – from where did you source the 3/8″ aluminum C-channel? Any help on this will be much appreciated. C channel can be found at the big box stores and some local hardware chains. Can you dim these lights? While I don;t use a dimmer, there are dimmers available for LED string lights. You might try a search string of “led string light dimmer” to see if any of the products meet your needs.